Indian Peaks Rental is conveniently located between Fraser and Granby, three miles past Tabernash right on US-40. From Winter Park, drive towards Granby. Look for us at the top of Red Dirt Hill, on the right hand side at the County Road 85/87 intersection. If you get to the YMCA of the Rockies, you’ve gone too far. From Granby, drive towards Fraser. 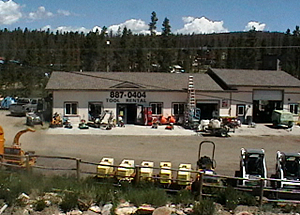 After you pass the YMCA of the Rockies, look for us on the left, at the County Road 85/87 interection. If you get to the turn-off to County Road 5, you’ve gone too far. Please contact us with any of your tool and equipment rental questions.